The flagship resort. Be the guest of an owner at many owner's favorite resort. Grand Mayan Acapulco Rental from Owners ! We represent literally dozens of timeshare owners, just so you can rent their extra weeks at Grand Mayan Acapulco for deeply discounted prices. The Acapulco location has always been the flagship for Mayan Resorts. The Grand Mayan Acapulco is the latest (and greatest) in luxury accomodations to be added. Grand Mayan suites are for those who are looking for more room and more amenities like jacuzzi tubs and balconies with cooling pools. The pool areas are designed to give you your own nook to hang out and order pool side snacks and drinks. Located in a separate set of buildings, the Acapulco version of the Grand Mayan is on the same property as the Mayan Palace . This property is located just 10 minutes from the airport and near where the new highway from Mexico City ends. The Mayan Resorts are called the most spectacular in Central America. A Grand Mayan Acapulco Rental is the finest option on this resort. The resort features excellent restaurants right on site. From a sushi bar to an Italian restaurant to the best Mexican cuisine has to offer. In fact, some of the best mole sauce (read Mo-lay, with the accent on the first syllable) we have ever had has been at a Mayan Resort. Kitchen with microwave, stove, toaster and of course, a blender. 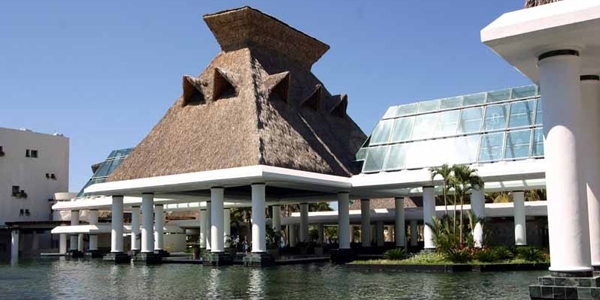 Grand Mayan Acapulco is just outside the cosmopolitan city of Acapulco. The combination of the half moon beauty of Acapulco Bay and the large variety of night clubs make it a to vacation destination in Mexico. Parasail and jetski by day, shop in international boutiques in the evening and then dance the night away at the night club of your choice. Acapulco has always been the symbol of international nightlife. Of course you can't go to Acapulco without going to see the cliff diver show ! If that sounds too hectic, the private beach is calling you to relax. Perhaps a massage in the spa after a 18 holes of golf. It's completely up to you!! Oh yea, forgot to mention there is an onsite Tennis Academy, so you can grab a few lessons or play a few sets. Follow the beach south a few miles (by car of course), and you will find small Mexican villages that well worth a day trip.